THERE is no better day to say thank you to mum than to spoil her with a sweet treat. For Mother’s Day I had been recreating my mamma’s lamb recipe for the San Carlo restaurants and everyone loves it. You can find the recipe on here. Now on to this week’s book, The Complete Aga Cook Book by Mary Berry and Lucy Young. It is full of very simple oven recipes for all the family, including the cherry cake and the classic Swiss roll (opposite). This book would make a nice gift for your mamma. Happy Mother’s Day! Grease a 20cm deep cake tin and line with greased baking parchment. Cut the cherries into quarters, put in a sieve and rinse. Drain well and dry thoroughly on kitchen paper. Measure all the remaining ingredients in a large bowl and beat well with a wooden spoon or with an electric beater, then lightly fold in the cherries. The mixture with be fairly stiff, which will help keep the cherries evenly suspended in the cake while it is baking. Turn into the prepared tin and level the top. Bake in an oven preheated to 160°C/320°F/gas mark 3 for about 1 hour 20 minutes, or until a skewer inserted into the centre comes out clean. Leave to cool in the tin for 10 minutes, then turn out on to a wire rack. To make the decoration, sieve the icing sugar into a bowl and mix with the lemon juice. Stir to a fairly thick icing. Spoon into a piping bag fitted with a plain nozzle, or a bag snipped at the point. Pipe swirls over the top of the cake. Pipe a slightly thicker line around the edge of the cake and press in the chopped almonds to give a nut border. Arrange the cherries in the centre. Can be filled and rolled up to 2 hours ahead and kept in the fridge. It also freezes well filled and rolled. Grease a 30x32cm Swiss roll tin and line with baking parchment. Whisk the eggs and sugar together in a large bowl or freestanding mixer until the mixture is light and frothy and the whisk leaves a trail when lifted out. Gently sieve in the flour and add the vanilla extract, carefully folding into the mixture with a metal spoon. a gentle shake, or smooth it so the mixture is spread evenly into the corners. Bake in an oven preheated to 200°C/ 392°F/gas mark 6, for about 10 minutes, or until the sponge is golden brown and begins to shrink from the edges of the tin. Leave to cool for 5 minutes on a wire rack. While the cake is cooling, cut some baking parchment a little bigger than the tin and sprinkle it with caster sugar. Invert the cake on to the sugared paper. Loosen the parchment on the bottom of the cake and peel it off. To make rolling easier, score a 2cm line along a short end of the Swiss roll, taking care not to cut right through. Tightly roll up the cake leaving the paper inside. Leave to cool. Whisk the cream into soft peaks. Carefully unroll the sponge, remove the paper and spread the jam over the sponge. Top with a layer of cream and reroll tightly. Cut into slices and serve. For Mother’s Day tomorrow I have been recreating my mamma’s lamb recipe for the San Carlo restaurants and everyone loves it. You can find the recipe on my website. 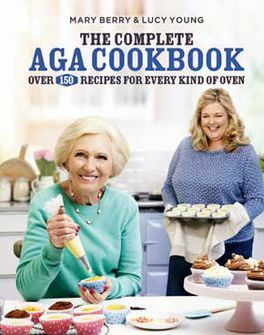 Now on to this week’s book, The Complete Aga Cook Book by Mary Berry and Lucy Young.